Calling all civil servants who might live or work in the Slough area! The Environment Agency, working with the Jubilee Riverside Centre project, have organised a community clean-up of the riverside area on Thursday 2 February. Our work will support the project aim of bringing the Jubilee River and the surrounding area back into use as a natural facility that can be enjoyed by all the community. 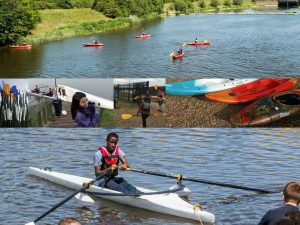 Plans include a water sports centre offering rowing and kayaking, along with fun days and other community activities. Volunteers are asked to arrive on site for 10.30am to receive a briefing and will be provided with appropriate equipment. Lunch and hot drinks will also be provided free of charge. As well as cleaning up the riverside, you'll also get the chance to hear about the work of the Environment Agency and the exciting long-term vision for the area. You'll be free to leave no later than 3pm. This promises to be a really enjoyable day out in the fresh air, and a great chance to contribute to an environmental project that will enhance the local community. To get involved, please contact Ian Barton as soon as possible and full details for joining the clean-up will be supplied.